Shop loud and proud as the Sale mania starts at a payday Friday- February 15 until Sunday, February 17. 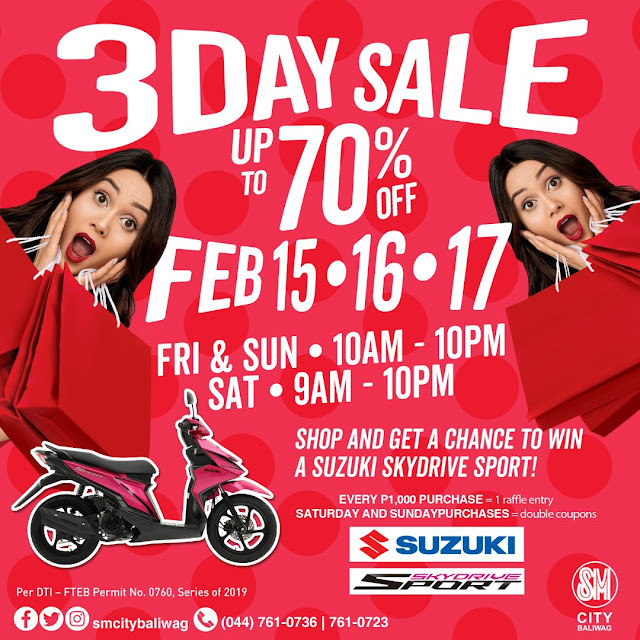 It is a shop-and-play experience as the 3 Day Sale not only brings big savings but also serves as a great avenue for fun as exciting games and prizes awaits to be unlocked during the Sale. Be the first to bring home the awesome deals, as great discounts of up to 70% off apply to countless items mall-wide. Check out the latest finds from The SM Store, SM Hypermarket, Ace Hardware, Watson’s, SM Appliance Center, Surplus and Miniso. Meanwhile, at The SM Store, SM Prestige Card members get EXTRA 10% OFF on great finds ALL DAY on Friday, February 15. SM Advantage Cardholders, SM Prestige and BDO Rewards Cardholders get EXTRA 10% OFF until 12NN on Saturday, February 16, and from 5PM-7PM on Sunday, February 17.